Not many major leaguers have a 19-year playing career that includes being a 10-time All-Star. Not many managers lead the same team for 12 straight years, let alone to back-to-back National League pennants and one World Series championship. Even fewer have been involved in baseball for more than 70 years. In fact, there’s just one man who has done all of the above — and nearly all of it while wearing Cardinal red. Or perhaps that should be Cardinal Red, given that man is Red Schoendienst, who today celebrates his 91st birthday. It’s good to see that the United Cardinal Bloggers are paying tribute to Red with our monthly project today. He’s been such a part of the Cardinals for so very long now, and deserves the recognition and tributes. In the three-year history of Aaron Miles’ Fastball, I’ve enjoyed honoring him on his birthday each year. And in case you don’t know much about Red beyond starring in perhaps the greatest Cardinals commercial ever, read on for what I wrote two years ago. And take a look at Red through the years in my post from last year. Albert Fred Schoendienst was born on Feb. 2, 1923, in Germantown, Ill., not far from St. Louis, and began playing baseball at an early age. At age 18, he went to an open tryout the Cardinals were having and was signed by the team. His professional career began in 1942, and in 1943 he was the International League MVP. He served nearly a year in the Army during World War II before being discharged in 1945. Red made his major league debut with the Cardinals that season, playing left field and stealing a league-high 26 bases. He moved to second base for the 1946 season, when he was named an All Star for the first time. Red also helped the Cardinals to win their third World Series title in five years, beating the Red Sox. Beginning in 1948, he was named an All-Star for eight straight seasons. And he made an impact — during the 1950 game, he hit a game-winning home run in the 14th inning for the National League. Red’s skillful play at second earned him acclaim, as even his plaque at the Hall of Fame includes a quote from his teammate, roommate and friend Stan Musial. The Man said that Schoendienst had “the greatest pair of hands I’ve ever seen.” He set a league record in 1956 with a .9934 fielding average, which remained for 30 years until surpassed by Ryne Sandberg. Red finished third in MVP voting that year, with his Braves teammate Hank Aaron winning the award and Stan finishing second. The Braves repeated as NL champions in 1958, but lost to the Yankees in a World Series rematch. In 1959, Red was diagnosed with tuberculosis and only appeared in five games. He recovered and played again in 1960, then rejoined the Cardinals as a player-coach from 1961-1963 before becoming a full-time coach in 1964. So Red’s Cardinals managerial career began in 1965, and he became, at the time, the longest serving Cards manager. (Tony La Russa has since surpassed him.) Under his direction, the Cardinals appeared in back-to-back World Series in 1967 (which they won over the Red Sox, fourth for Red’s baseball career) and 1968 (which they lost to the Tigers). Plus, in addition to serving manager through 1976, he served as acting manager in 1980 and 1990. His career managerial record is 1,041 victories and 955 losses. 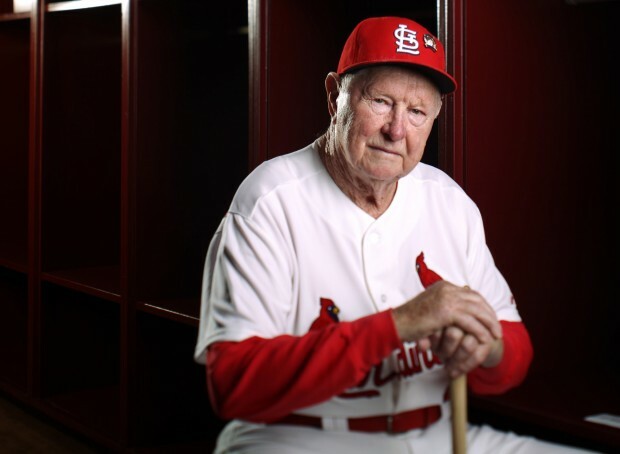 After coaching with the Oakland Athletics in 1977-78, Red returned to the Cardinals … and has never left. He’s been a coach (which he was for the 1982 World Champion team) and still serves as a special assistant to general manager John Mozeliak, meaning he’s been there for the 2006 and 2011 World Series victories as well — which is seven total championships. Red was elected to the Hall of Fame in 1989 and his number 2 was retired by the Cardinals in 1990. And so, on the occasion of his 91st birthday today, we’d like to wish Red the happiest of birthdays and a wonderful year ahead filled with happiness, good health and sharing his wisdom to help bring about another very successful Cardinals season! Christine Coleman is the lead writer for Aaron Miles’ Fastball. Follow her on Twitter, @CColeman802, or email aaronmilesfastball@gmail.com. Also follow @AMilesFastball for the latest updates and like us on Facebook if you don’t already. This entry was posted in General Cardinals and tagged Hall of Famers, Happy birthday, Red Schoendienst by Christine Coleman. Bookmark the permalink.